Team Xecuter (famous among other things for their work on Xbox and Xbox 360) just announced they are bringing a hack to the Nintendo Switch. They say their “solution” will work on any firmware. As a teaser for the upcoming release, they’ve published a video showing a custom boot of the Nintendo Switch (video below). Team Xecuter is historically heavily focused on hardware mods enabling piracy. Therefore it is not a stretch to think that what they’re working on for the Switch will also be a DRM-filled hardware modification, that they’ll make available for sale on typical online hardware mod retailers. This announce is made following the recent 34c3 talk on Switch hacks by Plutoo, Derrek, and Naehrwert, in which the hackers announced a homebrew loader was coming for Nintendo Switch running on firmware 3.0.0. Conversely, Team Xecuter are teasing that their solution will work “regardless of the currently installed firmware”. The console hacking scene has always seen a strong divide between “homebrew” hackers and the piracy scene. 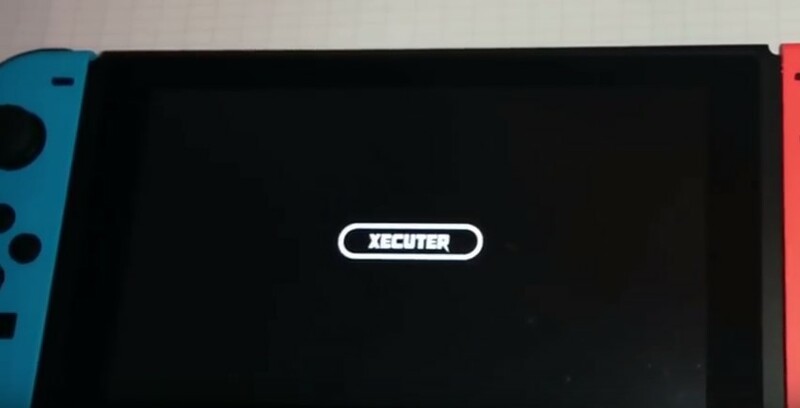 It seems the Switch will be no exception, with some hackers already stating they will not be using Team Xecuter’s product. Team Xecuter announced their “solution” will be available in Spring 2018. Although they’ve provided some decryption key for the bootloader as proof that they know what they’re talking about (for technically skilled people to verify), there’s always a possibility that this never gets released due to other issues. Team Xecuter have hinted in the past at some Xbox One hack that never saw the light of day (although, in their defense, it was never really announced); and we’ve seen other hardware hack ambitions fail in the console world as well once more open solutions were made available to the scene (think of the Cobra Blackfin on the Vita). Oh, yes! But what about online play? You’d need a patch for that ,yes? Do you need a patch to play online now? So *** are you going on about? I was talking about if you had cfw with pirate games? dummy. Wasn’t the Xbox 360 the only one that had an issue with online play? I’ve had hacks/mods on PS3, Wii, Vita, 3DS and Wii U that would allow me to go online without any patches. Only reason you needed anything for the Xbox 360 was because their security could pick up hardware mods very easily…. My jailbroken PS3 got banned like a week after going online with it. There was a PSN patch app people suggested using. Which I did but I still was banned. They had a harder time picking up flashed disc drives towards the end. RGH and JTAG are easily detected and result in a banned key vault. But in the black fin’s defense vita just never got the love it deserved thanks to sony and their mind boggling attempts to save it it really didn’t have enough AAA games to even need the fin. Too early, I would have preferred to see something like this in at least 2 years time. So… the Wii U sold about 13 millions unities in it lifespan. Switch in 10 months sold about 8 millions. I know I’m not a genius but I’m failling hard to see how 8 is more than 13? Maybe you’re talking about the fast-selling phenom? Or launching frame time between the two? The majority will still be buying games, especially since it’s a Nintendo console where most of the base are casuals. Hardware modificitation…yuck.Soldering the Switch motherboard is sin. Its also extremely easy to open a switch and get to the main board. ..and why is that? Because you don’t know how? There’s a good chance it’ll be solderless IMO, the EMMC is completely removable. If i had to guess, this ‘product’ would either replace the NAND, or sit in between it and the main board, and not require any soldering. I don’t think it will be between the emmc and the motherboard. That’s only data, if it can be done by only modifying data on the emmc nand then a simple hardware flasher would be enough, your typical sd card reader connected to the emmc (as it uses sd card protocol). TX would not be able to make any money from it. So they need to have something that probably glitches the gpu/cpu, and also they are probably working on making the method difficult to reverse engineer, so as to avoid the chinese making knock-off chips for as long as possible. But I hope this won’t lead to piracy. Big N doesn’t deserve it. They made a great product. Killing the switch games creation too soon..
piracy rarely kills a console, it usually actually helps it. Man, I get the argument, but there are plenty of examples where piracy seriously damaged a console. DS/PSP/Wii in particular come to mind. Software sales on those systems were super low after piracy started taking off. Some people would beg to differ, and actually argue that piracy helped the PSP gain popularity. I don’t know how substantiated those claims are – it seems everyone lives in a bubble of their own impressions and it’s an incredibly hard thing to put hard statistics behind, so we’re left to guess based on perceptions. Pretty sure the software attach rate of the Wii is the highest of all systems ever. As long as it allows save backups, that’s all I want. Sales say otherwise, PS4 still going strong. Leave kid. The DS, 360, PSP and Wii were all hacked for piracy by year 2. Each of those systems broke records in their own right. Meanwhile the PS3 and Vita for most of their lives were a fortress against piracy. Didn’t save them a single sale. The PS3 only turned around, ironically, after Sony’s major breach and compensation, then after that they kept Plus being useful and generous. Go figure, consumers flocked. Piracy doesn’t kills systems. Poor management and software does. Period. The PS3 turned around in 2009 with the release of the slim and their strong European market. The breach came 2 years later. when has a console being hacked hurt the console? Be very wary of this. This is not the original Team Xecuter this is another Max Louarn scam like the ps4 game swap chip. The original Team X ceased to exist several years ago and the website was sold to Max. Is this true ? How do you know that Team Xecuter is no more ? I can’t find any mention about it anywhere, and if it is true it would explain why no progress was made for the Xbox 360 Winchester board or fot the Xbox One series. Not even the PS3’s security was flawed after the dongles and CFWs. This will not be a permanent CFW (if it’s ever released). Someone has no idea what he’s talking about. Please, do tell. If you are not capable of, please don’t say anything. It’s hardware, it’s permanent, fool. Thank you for the free insult. You’ve demonstrated your overwhelming intelligence. Pop quiz, hot shot: will Nintendo stand on the corner without releasing a hardware revision?. It is completely possible with modchips and other hardware mods. Remember how the 3ds was hackable on any firmware as long as you were willing to do some soldering and hardmod it? It’s the same here, except i doubt soldering will be necessary since the switch has a modular EMMC, so it would be easy with an adaptor / intermediary board to hack, and is unpatchable since software updates can only edit the nand. That was my main doubt about this “future proof” CFW. Dongles are the best approach in my opinion but can be rendered completly useless with a simple hardware revision (even a software update could do it if the exploit is not in the early boot stages). On the other hand, complex hardware mods can give you the keys to the kingdom but they are not user-friendly and requires tools, electronic components and skills to apply to the console without damaging it. Ummmmm… what? The 3DS never required you to hardmod to hack it. The ‘hardmod’ was to dump your sysNAND in case you messed it up and needed to roll it back (or got sc*** il/legitimately by Gateway’s bricking). If it is a glitch chip then more than likely it is bulletproof a la 360 RGH. It directly attacks the CPU very early in booting up and updates to add fixes to security would be run after the console was already compromised. The only solution was to revamp the hardware but then new ways to do the attack were found rendering MS’ efforts useless again. It may use the Nvidia backdoor, but I can’t find info showing if that is able to be patched or not. The main reason Xbox 360 was able to gain so early hacks was possible to the fact that early prototype boards were stolen during the final stages of development of the board. Also the fact that the 360 basic hardware (CGPU, memory, and number of POST trace left on the board) didn’t change until the Winchester variety, the very final board that the CGPU is actually different and doesn’t have POST traces on it. That’s why the Winchester is still unhackable and to the fact that it was at it’s “End of life” period and no one gave two f**ks about 360s anymore, not even hacking communitys. That’s completely inaccurate. Without the 1BL, we had nothing, with 1BL, we had a chance, and that wasnt through early access to dev kits, as tmbinc said, the 360 was open to timing attacks, KK & jtag just came earlier. MS not signing the drive firmware was key to the drive hacks. Well.. I always glad when somebody have or find a way to hack one or other console. But this time it’s bad thing. It’s too early to do that. Console don’t have a lot games. So if this console will be hacked all creators not release they games for Switch. I was more glad to hear that PS4 or X1 was hacked. It was 100 times better. But.. Maybe this help to move PS4 and X1 to the hacked status. If for this need special device – it will be cool!!! !